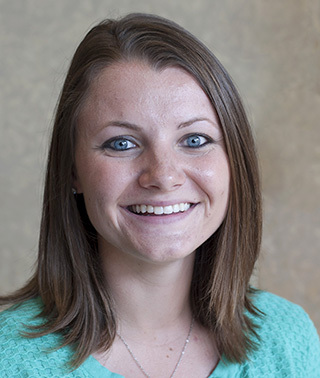 Amanda is a speech-language pathologist at Riverwood who practices in Aitkin. Experience: Previous experience in preschools and elementary schools as well as in the outpatient clinic and hospital (inpatient and inpatient rehab) settings. Experience serving patients across the lifespan with swallowing, language, articulation, pragmatic, and cognitive impairments. Provided group therapy for pediatric patients and adult patients with brain injury, aphasia, and dysarthria. Areas of Focus/Expertise: Evaluates and creates individualized treatment plans for inpatients and outpatients across the lifespan with a variety of diagnoses. Areas of interest include neurogenic disorders, aphasia, stroke rehabilitation, swallowing disorders, brain injury, and pediatric communication disorders. Amanda is also interested in expanding the pediatric rehabilitation program at Riverwood for children with speech or language disorders/delays, developmental delays, genetic disorders, social skill deficits, or any other condition that affects their ability to communicate and establish relationships.